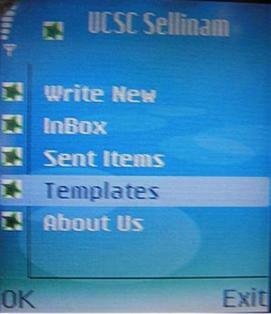 The following picture is the Home Screen of the UCSCSellinam application. if we want to write a new message. Select Write New menu. 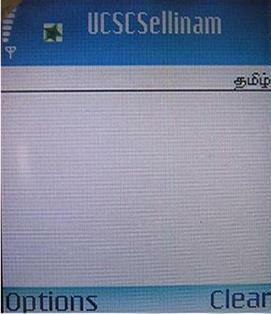 Following is the text editor where we can write a Tamil message. This editor will support to write in Tamil, English and Numbers. 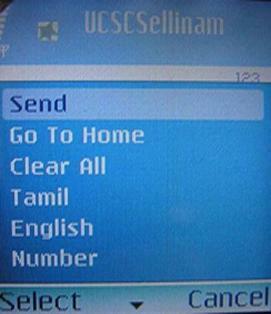 By selecting the mode we can write Tamil , English and Number. 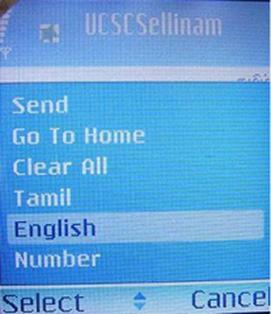 Default mode is Tamil. In the editor there is a indicator saying you are in which mode. 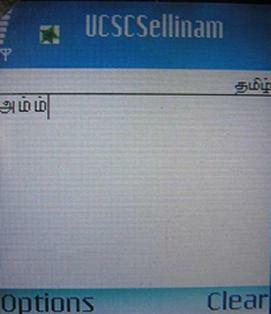 The following picture shows the Tamil mode. There are challenge that how to write all Tamil characters using these 9 keys. This keypad is supporting to write vowel and consonant directly according to the phonetic key mapping. Example if we want press the key 2(abc) you can see there is a helping menu is in the heading. 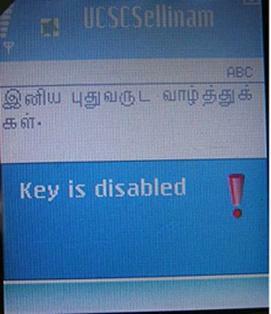 When you press key 2 , all the Tamil phonetic characters relevant (a,b,c) will be displaying. Then you can select the needed key. if you want press 6 because m is the phonetic character to so we have to press the key 6. All the vowels and consonant characters are directly mapped with these 9 keys. Another challenge is to write combined characters. 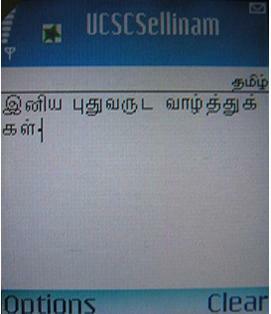 But we aware of tamil linguistic, we know how the combine characters are generated by using vowels and consonants. The combined characters are displayed below. 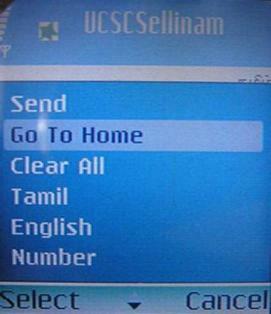 Change the input mode to English. 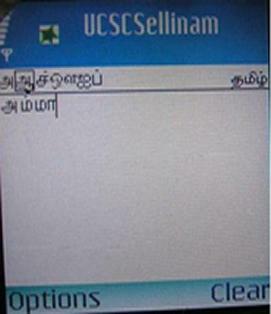 The following picture is showing Tamil and English by changing input mode. 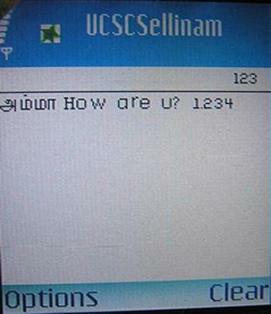 This enables us to write Tamil and English in the single message. 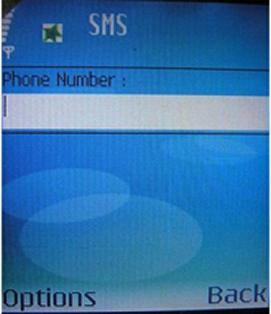 Change to the input mode to Number mode. In this mode you will be able to input numbers quickly. 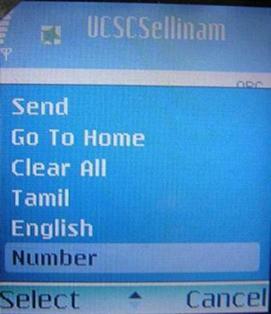 The following picture shows how to write Tamil,English and Numbers in the same message. If the keys is disabled for the specific mode, as it is pressed you will get a alert message same as in the following screen. 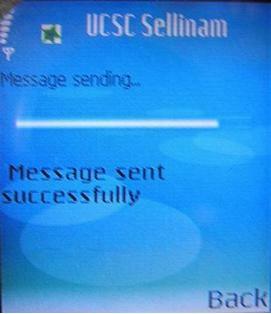 If we want to send a message click on the option command and select the send option, then you will get the screen to enter recipient's phone number. The next picture shows you how to do it. 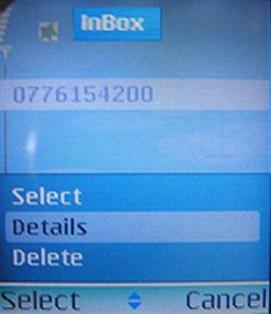 Enter recipient's phone no to send a message. When you send the message there will be a progress bar showing the message sending status. Once the message is sent successfully you will get the message as follows. 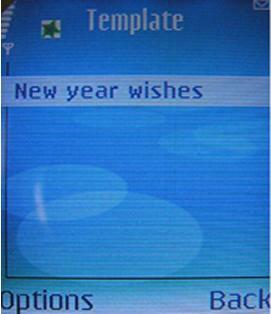 This application has a facility to save your message in a template location. 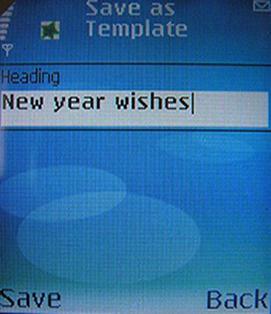 Eg:- "New year wishes", or "Theepawali wishes". These type of messages we can save it in a template location. Later if we want we can select a specific message and send to anybody. 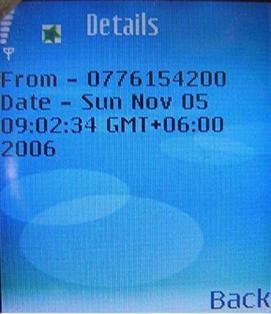 This enables you to have your own predefined messages to be sent later. To save the above message in to the template location. Select the "Save As Template" option. When we save the template message we should enter heading to identify the message. 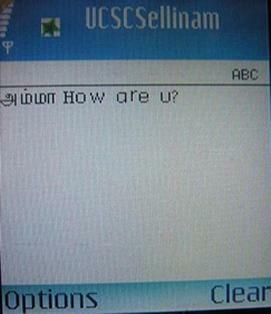 To view the already existing messages in the template location. 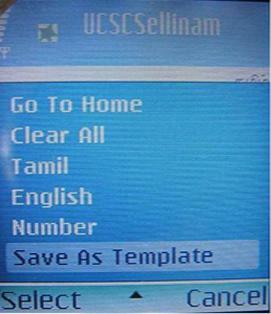 Select the Templates menu. There will be listing all the templates in your phone. Currently there is only one message. If you want to exit the text editor and go to the home screen then select the "Go To Home" option in the option command. 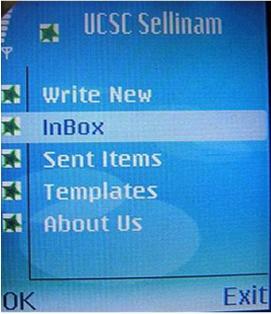 In the home screen we can see how many unread messages are in the phone. 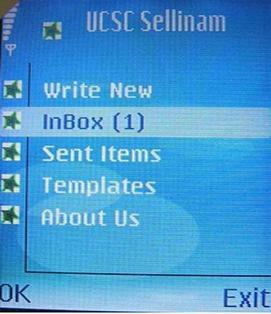 The following picture shows there is only one unread message in the Inbox. 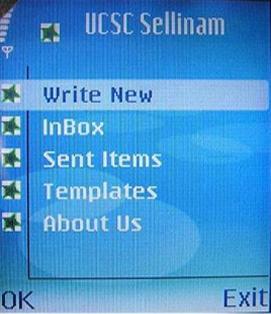 If you want to go to the Inbox then select the Inbox menu then there will be listing all the messages in the Inbox. (Currently there is only one message). There is a star indication whether the particular message is read or not. The following message is not read. It can be identified as the star is displayed as blue color. 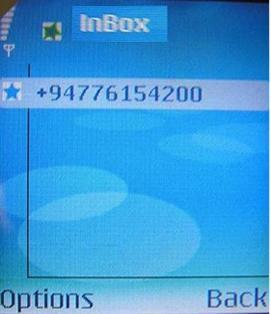 The following picture shows the Inbox location where there is only one message, which is read message. The following picture shows there is no unread message in the Inbox. Select the particular message then click on the Select command then there will be three operations which are "Select", "Details", "Delete". These three operations can be applied for all the messages. If we want to see the details select the Details menu. 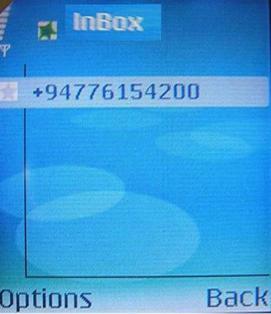 The following picture shows the Inbox messages's details. The following picture shows the details of a message.